Roasting vegetables is simple. Just add olive oil, salt and pepper and bake in a 400 degree oven. salads, added to sandwiches, or blended into soups. The seasoning ideas provided are optional. that are either oiled or covered with a piece of parchment paper to prevent sticking. Snap off the woody ends of the asparagus. Spread on a baking sheet. Sprinkle with olive oil and gently toss the asparagus to coat with the oil. Season with salt and pepper. Roast for about 15 minutes. Before roasting, toss with chopped garlic, Parmesan cheese, or chopped fresh thyme. After roasting, sprinkle with lemon juice or Balsamic vinegar, and some fresh herbs. Remove the tops and roots of the beets; peel the skin. Cut the beets into 1-1/2 inch chunks. Spread the beets on a baking sheet. Toss with olive oil; season with salt and pepper. Roast for 30 to 40 minutes, turning once with a spatula, until tender. After roasting, toss with raspberry vinegar or orange juice. Cut the broccoli florets from the thick stalks, leaving an inch or two of stalk attached to the florets, Cut the larger pieces through the base of the head, so the florets are about 1-1/2 inches wide. Place the florets in a bowl. Toss with olive oil; season with salt and pepper. Spread evenly on a baking sheet. Roast for 20 to 25 minutes until tender and the tips of the florets are brown. Before roasting, add sliced garlic cloves to the florets. After roasting, immediately toss with lemon zest or juice, Parmesan cheese, pine nuts or basil. In a food processor fitted with a slicing blade, coarsely shred the Brussels sprouts. Toss the Brussels sprouts with the olive oil, season with salt and pepper. 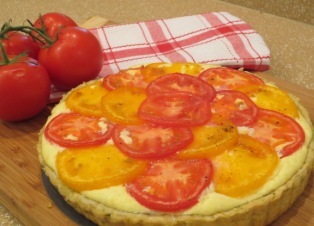 Spread in an even layer on a baking sheet. Roast in the oven for 30 minutes, until the Brussels sprouts are tender and browned in spots. Stir the Brussels sprouts halfway through roasting. During roasting, sprinkle the Brussels sprouts with Parmesan cheese, toss and bake for 1 more minute, or until the cheese is melted. Cut off and discard both end of the squash. Peel the squash, cut it in half lengthwise, and remove the seeds. Cut the squash into 1-1/2 inch cubes. Toss the squash in a bowl with olive oil. Season with salt and pepper. Spread the squash on a baking sheet in one layer. Roast for 40 to 50 minutes or until tender. Turn the squash a few times while it is baking, so that it browns evenly. If you would like the squash to be carmelized and sweet, use melted butter in place of the olive oil and toss with a few tablespoons of brown sugar before roasting. If the carrots are thick, cut them in half lengthwise; if not, leave them whole. 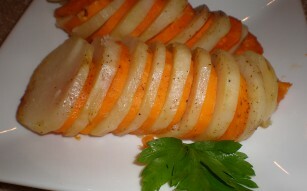 Slice the carrots diagonally into 1-1/2-inch pieces. Toss them in a bowl with some olive oil; season with salt and pepper. Spread them on a baking sheet in one layer. Roast for 20 minutes or until tender. Toss the carrots with chopped dill or parsley. Slice the kernels off the cobs with a sharp knife. Place them in a large bowl and toss them with the olive oil, salt and pepper. Spread them on a baking pan in a single layer. Roast for 20 minutes or until the corn starts to brown. Remove the stems of the fennel and slice the bulb in half lengthwise. Remove the core. With the cut side down, slice the bulb into ½-inch thick slices. Put the fennel in a bowl, drizzle with olive oil and season with salt and pepper. Toss the fennel gently to coat. Spread on a baking sheet in an even layer. Roast for 20 to 30 minutes, or until the edges are golden brown. Sprinkle the fennel with Parmesan cheese about 5 minutes before it is done. Roast for the final 5 minutes. Trim the ends of the beans and place them in a bowl. Toss with olive oil; season with salt and pepper. Spread them evenly on a baking sheet. Roast 12 to 15 minutes, stirring once, until lightly caramelized and crisp tender. After roasting, drizzle with orange juice and add toasted almond slices. Remove the thick stems from one bunch of kale; put the leaves in a large bowl. Drizzle with olive oil and sprinkle with salt. Toss the leaves so they are well coated with the oil. Arrange on a baking sheet in a single layer. Roast, flipping the leaves once, until the kale is crispy, about 15 minutes. After roasting, sprinkle with lemon juice and season with additional salt and pepper. Scrub the baking potatoes but don't peel them. Cut the potatoes in half lengthwise. With the cut side down slice the potatoes into long wedges about 3/4-inch thick. Toss the potatoes with olive oil; season with salt and pepper. 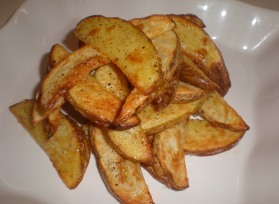 During roasting, sprinkle the potatoes with Parmesan cheese and roast 5 more minutes. Place the warm pepper strips into a shallow serving dish. Top with the oregano, garlic, olive oil, and vinegar. Season them with salt and pepper and mix them gently to combine the flavors. Let them sit to cool and serve at room temperature. Slice the zucchini lengthwise in half then cut into thick slices. Toss with olive oil, salt and pepper. Spread on a baking sheet and roast for 15 to 20 minutes, turn once during roasting. Before roasting, toss with Parmesan cheese, fresh chopped herbs or grated lemon zest, chopped garlic or shallots. After roasting, add a little lemon juice or Balsamic vinegar. Choose 1 large russet potato and 1 large sweet potato that are about the same size. Peel both and cut into 1/4-inch thick slices. Cut a small onion into thin slices. Butter 2 pieces of aluminum foil, that are approximately 12 x 12-inches.